The Xbox Live Gaming Centre up on South William Street will be running a competition to coincide with the European release of Dead Rising next month. Fittingly, the competition is to find the best-dressed zombie. 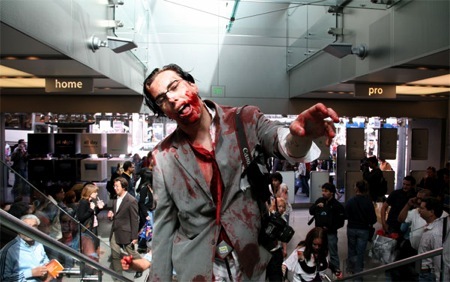 The Xbox Live Gaming Centre is running a best dressed zombie competition to celebrate the launch of Capcom's Dead Rising (rated 18's) which will be hitting the centre on Friday September 7th. On Saturday 8th September, at 3pm we will be holding the competition in-store. Prizes include â‚¬100 cash, "I Love Zombies" t-shirts and limited edition Dead Rising faceplates. Note: their dates are a little funny - Saturday is actually the 9th of September. The prizes aren’t awesome. Faceplates? No copies of the game? Still though, I’m happy with any excuse to dress like a zombie. See also: Zombies Invade San Francisco!